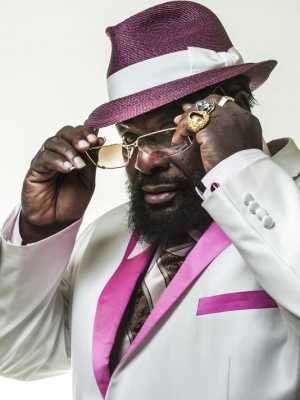 HE stands alongside James Brown and Sly Stone as one of the funkiest men ever to have walked the planet and now George Clinton, the driving force behind innovative American dance bands Funkadelic and Parliament, is striding towards a field near you. The man who has pushed the boundaries of r‘n’b about as far into outer space as it could possibly go, will perform at the four-day WOMAD extravaganza at Charlton Park near Malmesbury this summer. Clinton is among the first names to be announced for the globe’s most prestigious world music festival which, over the extended weekend of July 28-31, celebrates its tenth anniversary in Wiltshire. The county’s largest annual festival will, as usual, feature an extensive range of musical styles from around the world – from hurdy gurdy inspired Polish folk to “nourish indie-pop” from Tel Aviv. Clinton, one of the bill toppers, is the principal architect of the so called “P-Funk” sound, an uninhibited groove-based style which he pioneered with the groups Funkadelic and Parliament during the Seventies and whose influence can still be heard today, from rock to rap. Psychedelically infused albums such as One Nation Under A Groove and Maggot Brain are still cited as landmarks in the progression of black music which saw Clinton and his P-Funk family in 1997 inducted into the Rock and Roll Hall of Fame. His career as solo artist, producer and collaborator has seen him work with the likes of Red Hot Chilli Peppers, Primal Scream, Tupac Shaker, Ice Cube, Outkast and Wu Tang Clan. Also set for the 34th World of Music Arts and Dance festival is another giant of black music, singer/guitarist Baaba Maal, one of Africa’s most successful musicians who, like countryman Youssou N’Dour, has become an ambassador for his native Senegal. One of the first African musicians to attain the status of international superstar, Maal has performed at WOMAD on several occasions and is – as the old saying goes – back by popular demand. He has also been afforded an ultimate accolade….as a castaway on Desert Island Discs. Other artists also confirmed for the lush, expansive grounds of Charlton Park – a 30 or so minute drive from Swindon - include French-Lebanese trumpeter Ibrahim Maalouf. A leading session-man with credits on recordings by Sting and world music kingpins Salif Keita and Amadou &amp; Mariam, he is also an acclaimed solo artist whose music merges Arabic flavours and textures with jazz. A stomping New Orleans-style carnival vibe will arrive courtesy of the Hot 8 Brass Band, a hard blowing Crescent City combo currently celebrating their 20th anniversary. Congolese rapper, poet, composer Baloji, sweet voiced Ghanaian singer Pat Thomas and his groove heavy African hi-life outfit are also on the bill, as are The Grit Orchestra which specialise in full-blooded Celtic fusion and Sidestepper which mix Columbian vocals with electronica. Followers of the ever magnificent Ry Cooder will be aware of the veteran Hindustani instrumentalist VM Bhatt after their memorable 1993 collaboration A Meeting By The River. At WOMAD, Grammy winning Bhatt will be demonstrate a distinctive Indian blues sound from his latest project, Desert Slide. Such is WOMAD’s popularity that all the Early Bird tickets sold out before any acts were announced and general tickets are now on sale. WOMAD Festival UK 2016 takes place at Charlton Park, Malmesbury, Wiltshire, UK, SN16 9DG, from Thursday, July 28 to Sunday, July 31, 2016. For more information on options and prices see www.womad.co.uk for details.